Does alex846 belong in this group? Art is an Art I want to meet artists and get to know their works. I have a passion for words. I love reading, writing and editing. 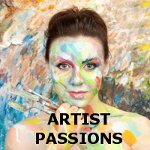 I am also a self-taught musician and artist. Does mapchannel belong in this group? Does mzzzcookie belong in this group?